The OUR Walmart campaign alleges that multiple strikers are being retaliated against. This story has been updated to reflect additional terminations, condemnations from members of Congress, and comment from Walmart. The original story appears below the updates. Update (10:45 AM EST, Monday):The OUR Walmart campaign now alleges that since Friday, Walmart has terminated nine workers who joined this month's strike, and disciplined eighteen others. According to the campaign, two other strikers were terminated during or after the strike but prior to Friday. That makes twenty-nine workers who went on strike this month and were allegedly punished; twenty-six of those strikers were among the hundred-some who traveled to Arkansas. Reached over e-mail, Walmart spokesperson Kory Lundberg told The Nation, "our decision had everything to do with what was a violation of attendance policy and nothing to do with a specific protest." Update (4:45 pm EST, Saturday): Of the roughly 100 Walmart workers who this month went on strike and traveled to Arkansas, OUR Walmart alleges that five have been fired, ten have received disciplinary “coachings,” and one has been suspended. Along with Lisa Lopez from Orlando, the other fired workers are from Miami; Chicago; and Lakewood, California. Organizers allege that one of the workers was told directly that the termination was for striking, and that several of the “coachings” were identified as punishment for “unexcused absence” during the strike. Reached by email Saturday regarding the alleged retaliation, Walmart spokesperson Kory Lundberg said that fired workers Maria Roberty and Jovani Gomez were “terminated for violating the Walmart attendance policy—to suggest otherwise would be wrong and not based in fact.” Lundberg wrote that Lisa Lopez and a co-worker “were both coached recently for committing the same food safety violation at the same time.” Lundberg noted that Lakewood worker Nicole Mora “gave her two-week notice” this week prior to her alleged retaliatory firing. Two of the workers who’ve been disciplined had previously secured victories after filing charges against Walmart at the National Labor Relations Board, the agency charged with enforcing private sector labor law. Washington State worker Jerry Paladan, whose case led to a notice being posted in his store reiterating employees’ right to speak up about health and safety, has been suspended. Kentucky employee Aaron Lawson, who was previously fired by Walmart but reinstated following an NLRB charge, is among the ten “coached” by management. Original Story (1 am EST, Saturday): The union-backed labor group OUR Walmart alleged Friday night that Walmart has retaliated against multiple workers who went on strike and traveled to its Arkansas headquarters this month, including Florida employee Lisa Lopez, whom the retail giant fired Friday. “I think they don’t want me to actually let people know what’s really going on at Walmart as an associate,” Lopez told The Nation. “So they’d rather get rid of me.” Walmart did not immediately respond to a request for comment Friday night. As The Nation has reported, about a hundred members of the retail workers’ group OUR Walmart, which is closely tied to the United Food & Commercial Workers Union, mounted a several-day strike in the lead-up to the retail giant’s June 7 shareholder meeting. That first-ever prolonged strike by US Walmart employees, which began May 28, brought Lopez and others workers from across the country to Walmart’s Bentonville, Arkansas, hometown, where they staged a week of protests. The OUR Walmart campaign described Lopez as a prominent activist, noting that she was the star of a campaign video, posted to Youtube May 31, which highlighted her reliance on food stamps and a second job to support her family. Lopez drew the attention of local and national media (including The Nation) during OUR Walmart’s November 23 “Black Friday” work stoppage, when US Congressman-elect Alan Grayson came to her St. Cloud, Florida, store to accompany her as she went on strike. Lopez told The Nation that she was informed by management Friday that she was being fired, ostensibly for bringing a Walmart policy book into the deli area where she works on May 23. Lopez, a nearly two-year employee, said she had received two previous disciplinary “coachings” from Walmart since Black Friday: one for wearing earrings, and one for not completing her assigned work by the end of her shift. OUR Walmart has previously filed a charge with the National Labor Relations Board alleging that Lopez was being singled out because of her activism. Lopez said that the earring rule was a newly implemented policy that a co-worker was not disciplined for violating, that the time that she couldn’t finish her workload was due to understaffing and that management gave her no indication last month that having brought the rule book to her work space would cost her her job. 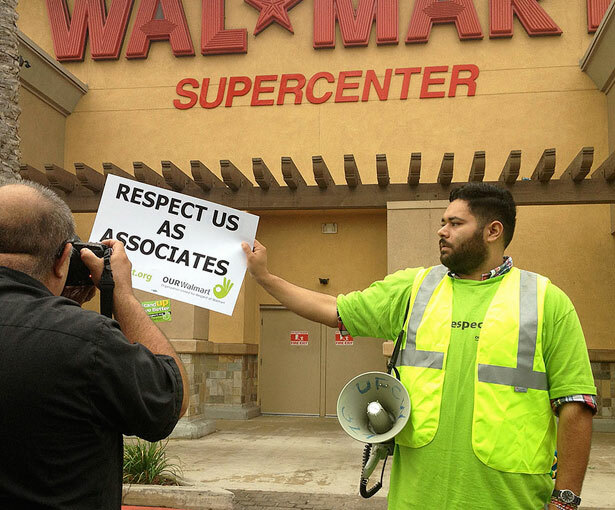 A May report by the union-funded nonprofit American Rights at Work—Jobs With Justice counted 150 incidents of alleged intimidation against activist Walmart employees, including the terminations of six early OUR Walmart leaders since 2011. Walmart contractors or subcontractors have fired at least seven workers active in the union-backed groups Warehouse Workers United or Warehouse Workers Organizing Committee; four were reinstated after workers at Walmart’s Elwood, Illinois, distribution center went on strike last fall. While acknowledging that strikes pose a risk of retaliation, OUR Walmart activists have described their strikes as a way of highlighting and punishing such intimidation. OUR Walmart strategist Dan Schlademan told The Nation last month that while “there is always a risk that a company like Walmart will break the law,” striking offers workers’ “strongest way to respond to Walmart retaliation, and I think all of these workers understand that.” “That’s why we’re doing this,” San Leandro, California, striker Dominic Ware said during the most recent strike, “to get rid of the fear and put an end to retaliation.” Strikers who traveled to Arkansas this month said that more of their co-workers would have joined them if they didn’t worry it would cost them their jobs. Building off a year of strikes and work stoppages, OUR Walmart activists recently went to Arkansas to protest at the company's shareholder meeting.